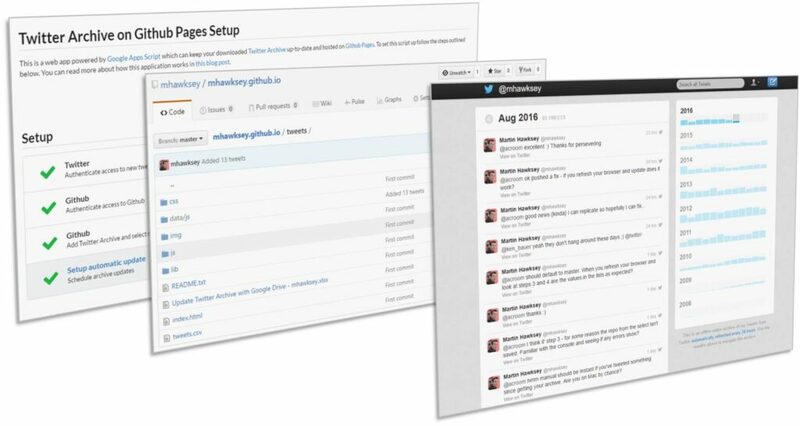 tl;dr How do you keep your downloaded Twitter archive fresh on Github Pages using Google Apps Script? By running this Google Apps Script powered web app. If you were to ask me which of my projects was my favourite you might be surprised by the answer. Regulars to this site might think that TAGS or my Twitter follower export or, longtime followers might think even recall the work I did on Twitter captions with Tony Hirst. In fact, while these are the posts more likely to earn me a beer at the bar, the piece of code I’m most proud of is ‘Keeping your Twitter Archive fresh on Google Drive‘. If you’re not familiar with this, in essence I’ve taken the archive of tweets, which available on request from Twitter, hosted it on Google Drive and kept it up-to-date with a script that runs every day. There are a couple of reasons this is my favourite. Notably it earned me a genius card from Alan Levine (this is a lonely game most of the time and recognition from your peers fuels the journey). Another reason is simply the code is poetry. The important term in that last sentence is ‘you could’. Google announced last year that it was ending the ability to use Google Drive as a place to host basic web content by the end of this August (2016). I wasn’t surprised by the announcement, Google Drive web hosting always felt like a feature that escaped into the wild rather than been purposefully released, never fully being integrated into the Google Drive UI, although it’s disappearance may be more down to misuse. I have however been able to caress my original solution to keep working, using Google Apps Script’s ability to publish a web app. If you are interested here is the source code of the webapp so you can see how data from Google Drive is included. This tweak is however is not without it’s drawbacks, in particular, performance isn’t great and Google impose a nag at the top of the webpage. Now there are many places you can freely host web content, and as touched upon in our last ‘Totally Unscripted’ episode these can be integrated into Google Apps Script. One option I’ve been interested in playing with is Github Pages. You might have come across Github before as a code versioning repository. As I (see my git post) and many others have highlighted in the past Github is not just limited to code, and has been used as a space to host, and importantly remix/modify, a range of content from books to music. An important aspect of any resource is how it is communicated to your audience. This is where Github Pages come in. They allow you to create a website to support your repository including rich content. Github Pages are updated in a similar way to to the content you version in a Github repository, creating new or modifying existing content which is committed as the current version, this means you can read/write Pages using the existing Github API. This isn’t the first Google Apps Script project that integrates with Github. Bruce Mcpherson has the very useful gasGit script that lets you backup/release Google Apps Script projects to Github, and I recall seeing other pieces of code floating around. If you’d like a peek at the code you can view it here or in this Github Repo. The interface is made using Semantic-UI mainly because I was looking for a step style interface. This interface is super elegant, a new level of genius card. I fixed their CSS by changing the positioning in .sidebar to absolute instead of fixed. Not sure if that will break the internet. Also, looking at the console, they load a bunch of images over http from https generating rafts of warnings. Call those code interns. Also- not sure why, but I am not seeing the comments on this post. I did wonder about tweaking Twitter’s index.html and starting the instructions ‘fork this repo’ … one day. Contrary to the Google Drive hosting (which broke a bit over the years), now the profile pic shows up correctly on every tweet. And with Alan’s tip I was even able to adjust the sidebar. Thanks again, guys! Lovely stuff, the new setup is very sweet and friendly. I wonder if you envisage folk pulling there arrive back down from GitHub for a local back up? Looking great, except that I wonder why I need to grant such extensive permission: “This application will be able to read and write all public and private repository data”, including basically everything. That seems neither necessary nor legitimate. All the app needs is read/write access to one repository linked to github.io. I won’t use this and won’t recommend this to anyone without more information on this. Thanks! It looks like all the tweets in the archive before your script adds new ones are missing timestamps. Compare my current tweets https://cogdog.github.io/tweets/ – the most recent have timestamps- but any time before August 2016 lack time stamps. This makes it hard to use the search not knowing the date of the tweet. I figure it’s a bug/feature removal on their side, just thought I’d mention it. Thanks for this excellent script. I had it working on Google Drive for years but to be honest forget about it. Until this week when I found out I am almost 10 years active on Twitter. I migrated from Google Drive to Github, which just works beautiful, thanks again. But I have a similar issue with date and time, although it is just the other way around. I also have this issue with Timehop, an app that shows my tweet from that day x years ago. It looks like the timestamp in my js files changed somewhere over the course of Twitter’s archive facility. I had those working for years on Google Drive until 2014. That’s the last time I updated the Google Drive version of the script. I still have those js files. So what I did, I downloaded the original older archive from Google Drive, put those in the data/js/tweets folder and commit & sync. But… Now the older tweets show a date and are in the correct order, you can see it on https://frankmeeuwsen.github.io/TwitterArchive/. But it doesn’t show the time. And newer tweets don’t show a date/time at all. So where to begin? I know I can make a local branch and play around with the source code but my js and bootstrap knowledge is very limited. Is there any way to solve this so that all tweets are in the correct order and show a date/time? You know, what would be awesome? Even more than the URLs by month, sometimes I want to link to the whole list of tweets containing a single expression – like showing my complete disgust of “wheeled suitcase”s. So it would be great, if the archive’s search results could get specific URLs, too. Hard to say without seeing your repo. Anything at https://*.github.io/ that gives a clue? My archive stopped updating 6 days ago and I don’t know how or where to fix it. I changed the Update time from daily to hourly. I’ve hit the “manually update now” button several times. It looks like it’s working but archive doesn’t update. I can tell from graph on archive my tweeting went way up so I’m thinking the issue is too many mbs or tweets. Can I fix this somewhere? Thank you so much for your work on this. It’s brilliant! Do you have or know of something similar that can archive Twitter favorites/likes? I would love to grab these, too. I tried all steps to bond twitter and Github and seems all checked. However, when I try to “Manually Update Now”, it stuck there forever. I actually set it up days ago but yet to see any daily archive(“last update time is 12/30/2016”). Do you have any clue of this? Hi – not sure what is happening here. Only thought is something happened on 12/30/2016 which prevented one of the files from updating correctly. Quickest way to see would be to request your archive again from Twitter and copy the files to github and see if it begins updating again. Hi Martin – once again, brilliant work. I appreciate the time/effort you put in to make this as idiot-proof as possible for folks like me. One question for you – any thoughts on how to update the information that pops up under “View Account Details”? That box brings up one of my old profiles with an outdated, no-longer-in-service website URL. Any way to force a sync with the most current profile from Twitter? Hi Damian – glad you like :) Quickest way is probably to request your archive again from twitter. You don’t need to redo any of the setup other than replacing the new files from Twitter on Github. BTW, thanks @Alan as well for figuring out the sidebar issue – that’s been vexing me for as long as I’ve used this archive solution (I’m also an old-school Twitter user whose history exceeds his laptop screen height). I have literally no programming knowledge, but thanks to your video instructions I managed to activate this app script and it worked beautifully! …until this morning, when google sent me a summary of failures saying this script has failed to finish successfully. Now it seems to have given up(?) and when I press the ‘manually update now’ button it just goes dim and nothing seems to happen. I would love to fix this problem. I’m a novice and don’t understand this. Can you help, please? I’m not aware of having changed anything at all at my end. Hmmm – not seeing anything wrong. Looking at the error message though doesn’t make sense as it refers to code that doesn’t exist. When you visit https://script.google.com/macros/s/AKfycbzbBwpWfqL4VMy9DYmaEaqZucGlXK6yKKEZWFqPzG6o0AKC2OjR/exec are you prompted to re-authenticate or are any of the green setup ticks missing? Thanks Martin. It looks like the github connection has been lost (no green tick). The address next to ‘check your archive’ is wrong (it should be https://github.com/k0711/), but I can’t figure out how to change it. :( Sorry for my ineptness. Hi Keith – I think the problem might be if you setup your and your partners data collection using the same Google account. This is because the script uses Google’s internal user properties storage and the way it’s currently coded is one user/one twitter archive. Would this explain the problem you are having? I don’t think that’s it. I was careful to log in and out of the two Google accounts. Besides, everything worked fine till a month or so or ago. I think I’ll just delete and reinstall the app on my account. That should fix it. Thanks again for creating this — it’s a little marvel! Hi Martin. Sorry to keep bugging you, but I’m still struggling. I’ve narrowed down the problem. It’s that the script is locked onto the wrong github repository. It thinks my archive is here https://keithfrankish.github.io// (an old, now deleted repository) and won’t let me select the correct one. When I try to select a repository, it says ‘no results found’. (It seems to log into github OK; I’ve disconnected and reconnected.) I was going to try a clean installation, but I can’t even work out how to uninstall the app. Do you have any suggestions, please? Thanks for the suggestion, Martin. I tried revoking access and re-authorizing, but it’s not fixed it, alas. The script still locks onto the nonexistent https://keithfrankish.github.io// (next to ‘Check your archive’) and no results show up under ‘Select a repository’. It’s baffling. Hi Keith – I’ve pushed an update to the web app so that step lets you see the username you are logged in to Github with. Does the username look right for your account? My only other thought is if you are logged in to multiple google accounts when you authenticate with Github to data might not be stored with the correct account. Possible? Do you have any idea why it’s dong this, please? So look like wrong github account is been connected. When you authorise access are you using k0711 ? Yes — it’s the only gh account I have. However — and this may be the nub of it — I originally named it keithfrankish. Could the script have stored the old name somewhere? (Though it worked fine with the new name for months.) I’ve tried deauthorizing and reauthorizing the script but it still thinks the account is called keithfrankish. Sorry to be such a pain! Bingo! That’s cracked it. Many thanks for your help and persistence. Hi — I’m having problems getting the app to run. It just presents me with a series of spinning circles and won’t connect to Twitter to begin the set-up process. (I’m logged into my google account.) Am I doing something wrong or could there be a problem somewhere else? I’ve run the app successfully before. Do you have any suggestions, please? I’d be grateful for any help. Thanks for this awesome Script! Any plans to support the new 280 Char Tweet length? Is this a hiccup on behalf of Github? I got an error mail from them a few weeks ago, but since I didn’t see any problem then, I didn’t read it exactly, so I can’t remember what it said. Ah, and as I see now, the last three years in the sidebar get repeated, too. Actually, I have no idea what that means and how to do that. Do I get a hint, if I rewatch the installion video? Or would it be better for a non-coding-guy to (ha!) simply rebuild a new archive from scratch? I was hoping you were a Github ninja as I’m not even sure about how you rollback to a previous commit but there is also an easier way. I’m sorry, but I went to this link, downloaded the files, wasn’t able to replace folders, was too lazy to replace every single file – I just opened a new repository with the downloaded data. Of course it lacked the tweets from the last two weeks, but the newly published site also contained the doublications of mostly retweets. I’m not a pro, for sure, but this is wrong, I guess. And I discovered a new bug: When I do a search in my archive, some tweets also show up repeatedly – some not. I guess which one do, is due to the repeated year statistics in my sidebar, but that’s just an educated guess. Hi – I’ve got another report of a similar problem so definitely a bug of some sort. I’m busy for the next couple of days but will try and find some time to see if I can debug. I realise that it’s been remiss of me not to thank you for this tool that I’ve been using since I first came across this post! It’s been ticking over without any intervention for more than two years to produce https://cpjobling.github.io/cpjobling-tweets/#. For info from the 11 October 2018 a code update introduced a bug where the script would add duplicate tweets to your archive. I’ve hopefully resolved this issue and pushed an update. There no need to do anything as the script will use the new code, but if your archive has become a mess you could download an earlier commit of your archive and rollback to this version (as long as you’ve made less than 3,200 tweets since the rolled back version the script will be able to collect all the data). I’m still experiencing the duplication issue for retweets. I’ve been able to modify and get rid of many of the duplicates, but it does seem to keep happening with every new refresh if the most recent tweet is a Retweet. I know you aren’t responsible for every change Twitter makes to their archive API, but I am hoping to continue using this archive in the future. Thanks for any help you might be able to provide. You are amazing! I’ll keep on retweeting things and I’ll let you know if it continues, but it was driving me bonkers for a while. Fortunately, I don’t have any problem going in and editing my archive manually. Thanks again for your ongoing support of this amazing resource! So after I messed up and tried to do this with “your Twitter data” (which includes everything about you and DMs and stuff that shouldn’t really go on a public visible archive. Oops. Thanks, this should work now. Thank you so much Ken for looking into this – I thought Twitter had killed this by no longer providing the archive in a format that can be used. Updated the instructions to let people know. Do you have any idea what has happened, please, and how to fix it? I’m reluctant to recreate the archive from scratch since I gather from one of your earlier replies in the thread that this may result in my losing data. Looking at why this happened for February 2019 it was because the first thing you tweeted that month was a RT from April 2018 https://twitter.com/amiguello1/status/987076270352752646. Many thanks for the rapid response, Martin. That worked perfectly! Your script, Twitter Archive Update to Github, has recently failed to finish successfully. A summary of the failure(s) is shown below. To configure the triggers for this script, or change your setting for receiving future failure notifications, click here. Can you help me diagnose the problem, please? I’m not even sure which of the three accounts is causing it. The error doesn’t seem to be generated on every sync.